We are annoyed by fruit flies. I have a few in every room. I have put out small dishes of apple cider vinegar, commercial “fruit fly trap,” sprayed the dirt in my plants with bug spray, no change. I have no fruit or food on counters. Actually, I think there are none in the kitchen, however, they are in the bathroom (no plants there). There is no one spot where they are more than others. Today I tried a bit of Dawn in the water when I watered my plants. Any suggestions? Oh, I enjoy your newsletter. Nice work. I have a great way to catch the fruit flies, but I don’t have any insights on where they may be coming from. Readers, can you help Ginger? Please leave a comment below. The fruit fly trap is a great tip I got from David Clark, the horticulturist who teaches the series of horticulture classes at the Buffalo and Erie County Botanical Gardens. 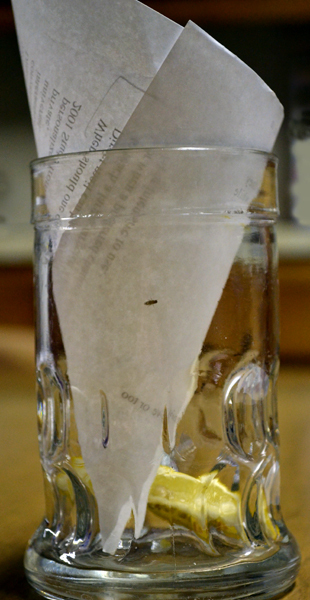 To make a fruit fly trap, you need a glass and a sheet of paper. Roll the paper into a tight cone with a tiny hole at the bottom. Secure the cone with a piece of tape. Throw a small chunk of fruit in the glass. A piece of banana peel works well, too. Set the cone in the glass. Make sure the cone fills the top of the glass. When you have caught fruit flies, take the glass outside and remove the cone. The fruit flies will take off. This worked like a charm for me. I’m a writer by profession, not an expert gardener. I interview knowledgeable people in order to provide you with great articles on Buffalo-NiagaraGardening.com. When someone contacts me with a question I can’t answer, I post the question and rely on my readers to share their expertise. If you have advice for Ginger, please leave a comment below. If you want to know the answer to these questions, check back later to read the comments. The businesses that support this magazine have very knowledgeable staff. 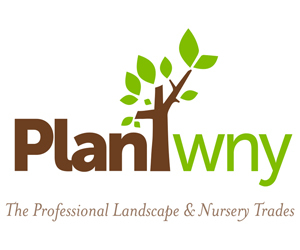 Check out our Gardening Directory and Garden Resources or click on an ad and you’ll get more information about their products and services. Please leave a comment below if you have tips on fruit flies. I, too, have been seeing what I assume are fruit flies, even though I have no fruit out anywhere. I removed plants, have scrubbed and scoured, poured vinegar down the drains, since they seem to be around the sinks. Nothing seems to work. I guess I can try the trap suggested, but I fear it may be like the japanese beetle traps which just attract more beetles. My best guess is they are breeding in the drains. I would pour a kettle-full of boiling water down each of your drains (don’t forget the shower) once a week for a couple of weeks. I hope that helps. I like your idea and the one from Phyllis. I have always combined two of the methods mentioned in the question. I pour a little apple cider vinegar into a teacup, then squirt a little dish soap into it. During our worst fruit fly times this past summer it would catch between 20 and 40 a night. Good luck! Those little buggers are quite annoying. Phyllis and Kristen are on the right track…I would recommend cleaning your drains with 1/2 cup baking soda poured in first, then 1/2 cup cider vinegar poured in second. Wait 30 minutes, and then run very hot water down the drains to rinse them out. Kristen’s apple cider and soap solution is very ingenious and I agree that that would work on fruit flies. Remember that the adult gnats [and fruit flies] are symptoms of the issue AND that there can be several stages of larval generations to deal with. This may take 2-3 weeks to overcome the infestation. Should anyone be having problems with fungus gnats in house plant soils, I would be most happy to reply to that also. Thanks all – and especially to David for the clarification of what these pesky things actually are. Upon reading today’s question I believe Ginger is dealing with fungus gnats. I just cleaned up a heavily infested professional office setting using sand and ‘mosquito dunks’. Again, the fungus gnat larva feed on algae, from a possibly over watered plant OR a recently purchased bag of soil may have become infested at a store. What you want to do is crush up maybe 1/4 of one of the dunks – this should be enough to treat 3 x8″ pots. Don’t worry, the dunks are harmless, containing a bacteria called ‘bacillus’. BUT, please do wash up after doing the procedure. So, sprinkle maybe a teaspoon of the pulverized dunk on the top surface of the soil and scratch it in just a bit. Now I want you to sprinkle a goodly amount of sand on top of the soil to absorb water, and these critters don’t like its texture. If your soil is wet, let it dry to a depth of 1″, as this is mostly where the algae grows – [WHY? : SUNLIGHT!] At the next watering, depending on the size of your pot, apply approximately 2-3 cups of water. The bacteria in the mosquito dunk will colonize the soil for about 6 weeks, and will reactivate itself when moistened. The process may take 2 weeks to be efficious, however you will see an immediate results as the plant begins to dry out. I few years ago I had a problem with fruit flies. I read somewhere that they can breed in drain lines. This made sense since I found many of them in the bathrooms and laundry area. Now I pour a little chlorox down my drains as soon as I see the first fruit fly. I haven’t had a problem in years. David, you can also get a product called “Mosquito Bits”, which is in small pellets, ready to be sprinkled into the soil. I’ve used this on my plants. Thank you for the ‘mosquito bits’ information! It is important to learn something new every day. Yes, I do believe that pouring a bit of clorox down the drain would work. After all, pool owners use chlorine derivatives to control ALGAE in the water. Thank you for your tip! Remember to treat the overflow in your bathroom sink when you do the drain. These certainly sound like fungus gnats. (Fungus gnats and fruit flies are about the same size but fungus gnats have long legs and long antennas. Fruit flies usually have red eyes.) I’d bet that the plants that have the gnats were brought in from outside. The warmer temperatures indoors cause an increase in the number of generations of gnats. We are more likely to notice the gnats at this time of the year as we spend more time indoors. If you want to be sure these are fungus gnats place a piece of potato into the soil of plants. If there are fungus gnats the larvae will migrate to the potato slice and will start feeding on it. I would also suggest that you use this time to repot your plants. Frequently the soil and/or other media in which the plants are growing has often broken down, become compacted, and is holding way too much water… which is exactly what the fungus gnats need. Be sure to let plants dry out before watering and don’t let them set in saucers full of water. Fruit flies are attracted to vinegar. I once washed a kitchen wall with vinegar hoping the smell would repel them; instead, they all congregated on the wall. The trap method works well. I used very ripe banana skins & pieces of ripe banana. They love that. I know they are annoying but have you noticed how cute their noses are?